Cuba has the best calling card a country can dream of: its most genuine and traditional music has been carried to every corner of the planet in the hands of the legendary and top class artists who form the Orquesta Buena Vista Social Club®. Now these exceptional musical ambassadors will return to their homeland to celebrate the grand finale of the farewell “ADIÓS TOUR” which started off in 2014. 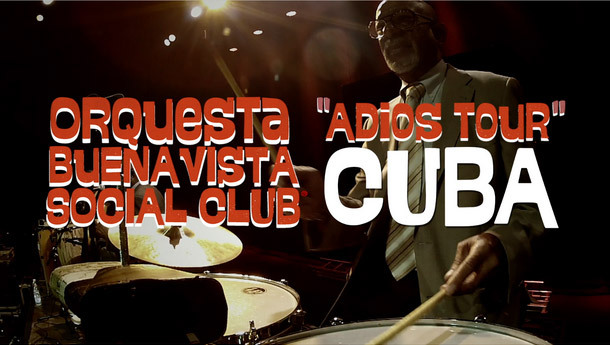 The Orquesta Buena Vista Social Club® global journey could not end other than in the place where it all began. Cuba, home to these unique artists and the eternal cradle of essential rhythms, will be the final point of the “Adiós Tour” this Saturday and Sunday 14th and 15th respectively at Teatro Karl Marx en La Habana. Having toured the world for so many years, this will be a unique opportunity for Cubans themselves to enjoy a phenomenon that is 100% native to Cuba!